The Paris Climate Change Agreement, a landmark treaty signed by members of the UNFCCC in December 2015, has entered into force today (November 4). So far, 94 of the 192 signatories have ratified the agreement, which is beyond the threshold of ratification by “at least 55 Parties to the Convention accounting in total for at least an estimated 55 per cent of the total global greenhouse gas emissions” for the agreement to come into force. The European Union ratified the agreement in October 2015, ensuring the agreement’s enforcement, 30 days later, as per the agreement. India had ratified the agreement on October 2 while other major emitters China and the USA had submitted their instruments of ratification a month earlier. The Paris Agreement lays down the objective of limiting global warming to 2 degrees Celsius (ideally 1.5 degrees Celsius) by 2030. The objective is to be achieved through Intended Nationally Determined Contributions (INDCs) for reductions in greenhouse gas emissions. While the Paris agreement provides a broad framework, the specifics of implementation, monitoring and the establishment of new institutions remain to be detailed. Although not stated explicitly, the Paris Agreement was prepared with the assumption that it will come into force only by 2020 when the Kyoto Protocol wraps up. But the agreement’s entry into force has come within a year of signing the treaty in Paris, much sooner than expected even as the 2012 Doha Amendment of the Kyoto Protocol, which extends the mandate of the Kyoto Protocol up to 2020, is yet to be ratified. What to expect from COP22 climate change conference? The COP22 climate change conference to be held in Marrakesh from November 7-18, 2016 shall also be the site for the first meeting of the members of the Paris Agreement’s governing body—the CMA. The meeting is scheduled to happen on November 15. As less than half of the signatories have ratified the agreement so far, it is highly likely that the CMA1 (first meeting of the CMA) shall be suspended. “During the pre-COP meetings held recently, it was decided that the CMA meeting should be suspended this year to allow time for other signatories to ratify the agreement and be a part of the decision-making process,” said Ravishankar Prasad, a Joint Secretary for Climate Change at the Ministry of Environment, Forest and Climate Change. The UNFCCC statement, too, hints at 2018 as the year by when members are expected to complete the details of the “rule book” that shall decide the implementation of the Paris Agreement. But while it is highly likely that nothing shall be set in stone during CMA1, progress in negotiations on specifics regarding adaptation, loss and damages and financial flows is expected. 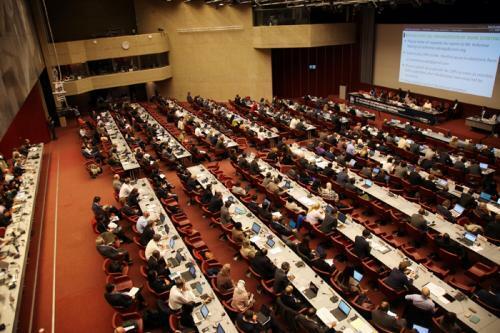 The establishment of institutions to coordinate capacity building and technology transfer and development, as well as a review of the finance mechanism, is likely to happen at the COP22 and CMA1 meetings this year, according to officials at the MOEFCC. One of the talking points during this year’s COP is likely to be the financial mechanism at play for climate change action and specifically, target of mobilising US$100 billion from developed countries towards developing countries by 2020. The Organisation for Economic Co-operation and Development (OECD) has released a roadmap detailing the mobiliSation of about $67 billion from national commitments and further $22.8-25.5 billion from private entities by 2020.